Description: Meranti Batu / Red Balau resembles the rich classic look of Genuine Mahogany. Meranti Batu heartwood ranges from a medium red to a deep red / brown and often has resin canals with white contents in concentric lines on end surfaces produce a warm and visually striking effect; the texture of Meranti Batu is moderately fine and grain is typically interlocked. More Info: Meranti Batu hardwood has become one of the most popular exterior decking woods on the market today. Nova imports and distributes our Meranti Batu decking throughout the U.S. and Canada through a network of leading distributors and retailers. Nova's Meranti Batu is graded and inspected at the source by our own personnel ensuring that our material is of the highest quality. Durability Rating: Excellent. Nova offers a 25 year warranty on Meranti Batu against rot and decay in temperate climates. Working Characteristics: One of the easiest to work relative to typical high density tropical decking hardwoods. Meranti Batu is much easier to install than Ipe or Cumaru. 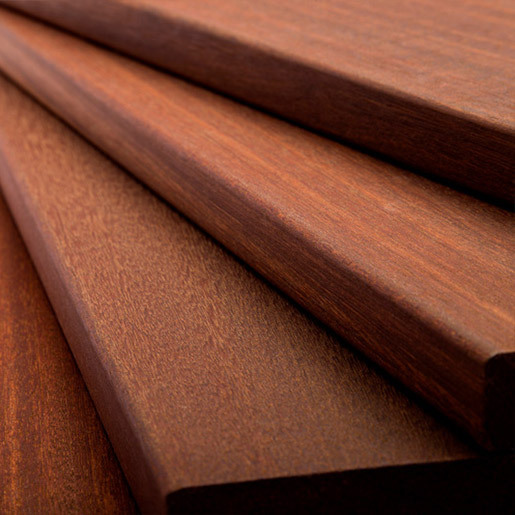 Applications: Meranti Batu is idea for exterior decking, millwork, railing, porch flooring, siding, soffit, wainscotting.